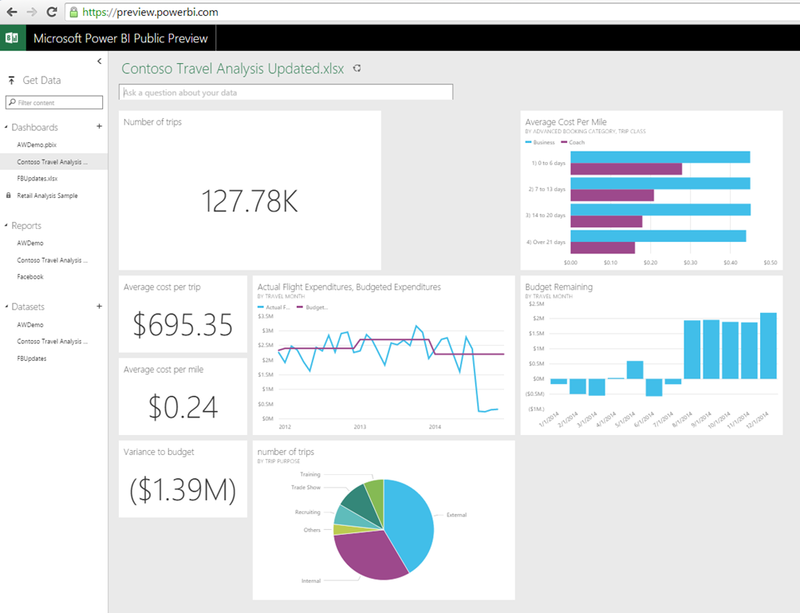 There’s been a lot of Power BI-related news in the last few days. I think it’s enough to say that there is a new Power BI in town, a very different (and much better) story from what we’ve had up to now. Sadly the preview is only available in the US at the moment. So what does all this mean for us, the Microsoft BI community? One of the biggest complaints I’ve heard from people who are just starting to test Power Pivot and Excel 2013 is that it just hasn’t been stable (even compared to Excel 2010 Power Pivot). If you’re evaluated new software then crashes and weird behaviour are a massive turn-off, and I sincerely hope that the new update will improve the situation here and make people’s first impressions of Excel as a BI tool much better. OK, so Excel is still important but it’s no longer the centre of the Power BI universe. We can now create models and reports in the browser, and even more significantly we have the Microsoft Power BI Designer, a standalone app which is basically Power Query and Power View (no Power Pivot as yet, but I’m sure that will come) bundled together minus Excel. Also, dashboards and reports no longer have to be stored inside SharePoint, there’s a separate site at https://preview.powerbi.com/ for viewing and even creating them. The whole Office 2013 Professional Plus/Office 365 requirement is now gone. Yes, Power BI will integrate well with Office 2013 and Office 365 if you have it, but you don’t need them any more. This removes a massive barrier to adoption for Power BI: in the past year or so I’ve seen lots of customers get excited about Power BI and then realise they can’t use it because their organisation isn’t using the right version of Excel, or isn’t an Office 365 customer, or they have the wrong SKU of Office 365, and so on. We no longer have to wait as long for new functionality. The new HTML5 Power View is available in Office 365 and PowerBI.com but in Excel on the desktop, even after the latest updates, it’s the old Silverlight Power View still. Tight links to Excel slow down the delivery cycle and prevent Power BI from competing effectively. Excel has clearly not been abandoned but my guess is that it won’t see new features arrive in Excel at the same pace as the rest of Power BI because, well, it’s Excel and it moves very slowly (the Excel team are rightly very cautious about new functionality – if Excel is broken then millions of companies around the world have big problems). There is a down side to this: more choices and more confusion over which tool to use. Do you build dashboards and reports with the Power BI Dashboard Designer and PowerBI.com, with all the latest Power View chart types and other cool new stuff; or good old Excel, with its mature, well-understood functionality like PivotTables, cube functions, and the worksheet, plus SharePoint Online and Power BI sites; or a mixture of the two? How well do the options work together? What functionality is available in each option exactly? More conservative users will opt for the latter; BI consultants like me will probably go for the former. But it’s yet another difficult conversation to have with the customer. Is The New Functionality Any Good? It’s fast and I am impressed with how easy it is to use too. Although it’s not ready for production use yet (see below) I can imagine it will be quite soon and it should be good enough to win some deals then. It’s still a long way behind some of the competition in some respects, such as variety of chart types, but in other respects (such as the kind of transformations available in Power Query and the types of advanced calculations that are possible in Power Pivot) it’s as good if not better. Mobile BI On iOS At Last! At long last we have a mobile BI story on iOS. I haven’t played with it but I have seen demos and it’s pretty good. The touch interface is cool. There’s a lot of functionality missing in the current build by the looks of things. The Power BI dashboard designer includes Power Query and Power View, but what about Power Pivot? I’m surprised it’s not included, and I strongly suspect it will be in a later release. Where does Power Map fit in, if at all? We can connect to on-premises SSAS Tabular, but when will be able to connect to Multidimensional? It will be interesting to see what gets released in the next six months. I bet we’ll also see new chart types and data sources very soon. I hope the Power BI team copy the approach the Power Query team have taken and release new builds every month. And please, please, please Microsoft don’t screw up on the licensing again. No details on it have been released yet. I hope they keep it simple and affordable. Apart from the whole Office 2013/365 issue, the other major blocker to adoption of Power BI is the fact that it’s cloud based and that hasn’t changed. Some customers (especially in Europe) are never going to consider a cloud BI tool because of data privacy concerns, and I don’t think that’s going to change soon. Then there are the loyal MS BI customers who have invested heavily in on-premises SharePoint and can’t just ditch all that infrastructure to move to the cloud. Microsoft needs to have a Power BI story for these customers too. Finally, what I think could be the killer feature for Power BI: the APIs. Microsoft products are most likely to succeed when they give the partner community a platform to build on. Even if Power BI might not match some of the features of other products out there the ability for a partner to push data into Power BI and support obscure data sources will, I think, allow Power BI to beat its rivals in many cases. Overall I think the changes that Microsoft have made to Power BI are the right ones in the circumstances. If I’m honest, over the last year I saw a lot of hype for Power BI, a lot of interest in it from customers, but while Power Pivot and Power Query are being used more and more there are very few customers who are using the whole package. The reasons are clear: the Office 2013 ProPlus/365 requirements; the fact it’s in the cloud; and the fact that it’s horrendously difficult to understand what Power BI even is and how the components fit together. The new Power BI deals with some of those problems but not all; I hope Microsoft has done enough to ensure that Power BI gets traction in the marketplace. The new functionality is really good and I’m a lot more optimistic about the future than I was. If Microsoft can keep up the momentum it will have a hit on its hands. The next 6 months are crucial. Microsoft has to constantly deliver new features, demonstrating it can reduce the distance from other vendors (especially in data visualization area) and that the product is alive and constantly evolve. Slowness in patches of existing features (waiting 18 months for fixes of Power PIvot in Excel 2013 is just too much) and realease of new features (which was good in Power Query, but very bad in Power View) is what makes a product “alive”. The Power BI Designer can be a wonderful way to define the new “local cube” file standard. Just open API to it, allow ISV and system integrators to create PBIX files and we’ll see interesting scenarios. Licensing is a key point here. Giving the single-user desktop version away for free, and licensing only the cloud services (and the server version once they will release an on-prem version – maybe one day?) would align to the current competition. hey Chris, do you know for the “embeddability” option for Power View dashboards (in blogs etc) how is the content licensed? No details on licensing yet. The embeddability might be similar to the story as with Power View reports from Office 365, but I guess we won’t know for sure until the licensing has been properly explained. Reblogged this on MS Excel | Power Pivot | DAX . 6 months ago I attempted to review the Power BI offering and decided to leverage Tableau instead. I was hoping to continue using and expanding our MS environment. When Microsoft figures out how to connect to Multi-Dimensional cubes from Power BI and provide solid mobile apps, I will probably take a second look. Tableau is a fairly expensive product at a price point around $2500 per report author (including desktop and the online license). really exciting progress! looking forward holiday when I’ll have time to explore on my own. Access to onprem data, i think, is key to driving adoption. A bit confused that they didn’t include multidimensional – could it really be that much more effort? Microsoftilta on tullut Public Preview-versio PowerBI Dashboard-versiosta. Valitettavasti ei vielä toimi Euroopassa. Chris Webb:in blogissa on hyvin kerrottu perusasiat – ja kommenteissa muutama hyvin validi juttu. Valitettavasti takamatkaa visualisointien, joustavuuden ja muokattavuuden suhteen verrattuna esim. QlikView:iin on vielä jäljellä rutkasti. Uuden version hintoja ei ole vielä tiedossa. Nykyinen versiohan on Qlik:iin ja Tableau:hun verrattuna puoli-ilmainen. I think you mean “but not in Excel on the desktop”, correct? No, I mean that in Excel on the desktop, even after the latest round of updates and bug fixes, you can still only use the Silverlight version of Power View. It’s only in the browser that you see the new HTML5 version of Power View. Re measures and calculated columns, I don’t know for sure but I’m 95% certain that this functionality will come in a future release. My guess is that it just wasn’t ready for this release. Hi Chris. Thanks for your reply. I’m also interested in your observation in the article above “though I think ‘dashboard’ is a misleading term here, because it’s not what a lot of us would call a dashboard). Not having much experience with dashboards, in what ways is it deficient? Usually with dashboards you can do things like apply filters to what you see, and use one filter to control multiple views. You can do this when you go to a Power View report; I would say that the dashboard is more of a home screen. 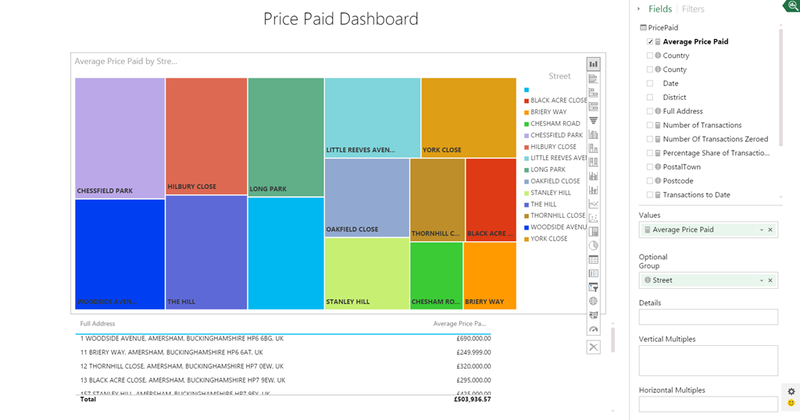 Any of you tried the new Power BI designer ? It will simply not start at all on my Windows 8.1. The application crashes. It’s Works on Windows 2012 R2!!? Any of you experienced same problem ? And if so do you know any way to fix it? Yes looks like my Windows 8.1 have a serious and strange problem.. Tested it on another laptop with Windows 8.1 and yes it Works fine. Problem is I don’t have a clue what’s wrong with my own Win 8.1..
Jen: how can you create a calculated column? Are you talking about Power Query? This is not the same you can do with DAX in Power Pivot. Otherwise, where do you create a calculated column in DAX with Power BI Designer? Marco, you are right. The calculated column in Power BI Designer is in the query view – Power Query. It is not the same power per se as DAX Power Pivot. There is a lot of work left to do. What you see rigth now is an early preview. Arthur, you are also right. I totally agree. As soon as I am allowed to more openly communicate with the community, I will. Hi Jen. Happy holidays to you. Thanks for your response. There are a lot of people pulling for Microsoft to continue to improve this awesome product. One thing that I think Microsoft could do better is to communicate with the user-community on a more timely and consistent basis, on influential blogs like this one and SQLBI and PowerPivotPro websites. Keep up the good work. Can’t wait to see what’s next. Chris, in your spare time 🙂 Can you write something up about this, http://blogs.msdn.com/b/powerbidev/archive/2014/12/30/10582527.aspx in a step-by-step way that an “Excel” person can follow along with at home if sufficiently motivated. It’s on my list of things to do! We were working on the Microsoft Power BI Public Preview. Some of the limitations we found during our exploration are as below. Are there any work around for these limitations? Created a Power View report which contained a stacked bar chart having data labels. Used this as a source to create a dashboard. The data labels are not visible on the chart which is pinned to the dashboard. However, they are present on the report used as the source. Question: Is there any way to get the data labels on the dashboard as well? When we pin a table to the dashboard, the column width is auto resized. It does not maintain the formatting shown in the report. We are unable to adjust the column width. Question: Is it possible to resize the grid columns on the dashboard? We have an Excel file with Power View reports. We are unable to refresh this file online as I have native queries in the Power query. In order to overcome this, we refreshed the Excel on local machine and re upload it. On doing so, it does not replace the existing report but instead uploads a new file with the exact same name. As we have previously created a dashboard with the old report, the dashboard is not refreshed. We have to delete the old file, dashboard and recreate a new dashboard based on the new file. Question: Is there any way we can re upload the file and replace the existing one? This is the initial dashboard created on the Power View report. Refreshed the file and re upload it as an Excel workbook. For grid resizing, that also is nit yet available. The upload duplicate issue is a bug we are actively working to resolve. Tjis only hapoens with uploaded pbix and Excel file based sources. If you use OneDrive, you can overwrite/update in place without getting annoying dups.